How do we create relationships with the past? How does history continue to influence our connections in the contemporary world? These are questions that Hannah Claus’s work considers as artist-in-residence at the McCord Museum. 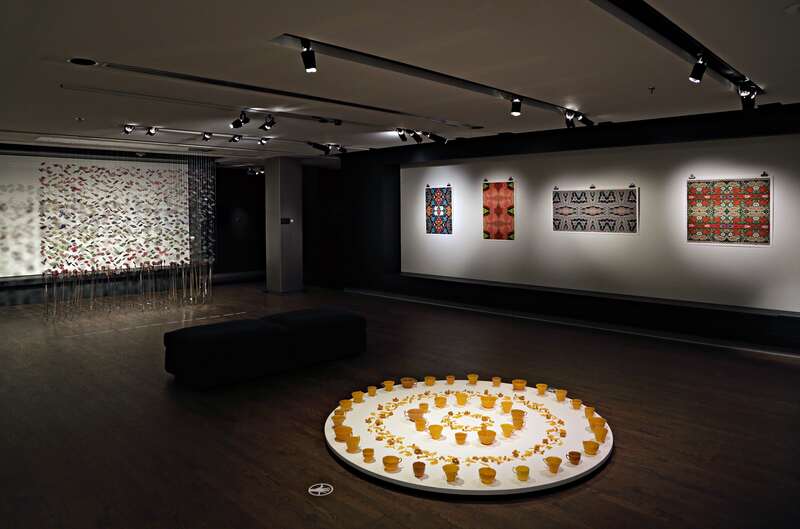 The exhibition contains multidisciplinary works, incorporating beading, sculpture and installation to navigate themes of memory and connection, and the relationships between past and present. The exhibition was created during Claus’s time as an artist in residence at the McCord Museum. Hannah Claus is a multidisciplinary artist, based in Montreal, and of Kanien’kehá:ka (Mohawk) and English heritage. Her works look at themes of Indigeneity, memory and transformation in its various forms. Claus was inspired by various sources to create this exhibition. Claus was able to go through the archives of the museum and find artifacts and register books, which influenced the thematic elements present within this exhibition. Other works displayed in the exhibition, in a vitrine, include Indigenous beading works, such as cradle board covers, and register books from the fur trade. The legibility, or lack thereof, of the fur trade registers’ writing and documentation stood out to Claus. This lack of clear communication over trading not only speaks to the impact of colonialism and how it affected Indigenous communities, but also provides greater insight into the fur trade and its impacts. Claus explains, in a short video for the museum, that the title of there is a reason for our connection, “evokes the interactions between people when they meet.” The artist shares that she is specifically interested in personal stories and archival documentation, rather than universal recounts and artifacts. In the centre of the exhibition, a circular plinth is covered in teacups and leaves, all made from beeswax. The cup structure was inspired again by Claus’s journey through the museum’s archives, where she found china and ceramics, made from porcelain. However, for the cups in her exhibition, Claus took molds from her mother’s personal china collection (which Claus herself helped polish when she was younger). There are berries and leaves within the pattern of the cups, which are also made from beeswax. The leaves and berries find significance in that they are often used to make Indigenous teas, which are medicinal and healing. Claus is well-known for suspended installations, and one such work is also present in there is a reason for our connection. The piece, titled fancy dance shawl for Sky Woman, consists of small, circular pieces, connected by string and hung in a linear formation. At the bottom of each string, there are metallic, reflective strips of material, which create light and reflections across the wall and on the ceiling. The piece also has movement, and gently sways as viewers move around the gallery. The piece is inspired by a Haudenosaunee creation story, about Sky Woman, which is passed down through oral tradition. The artist describes the work as connecting the earth and sky through thread, while also connecting the past and the present, with this tale of creation, to the contemporary world. On one of the walls of the exhibition space, four grey blankets are presented. At closer inspection, viewers can see subtle patterns created by copper pins. These patterns are inspired by traditional Indigenous designs on Wampum belts. Wampum refers to tubular beads to create ornamental, ceremonial and commercial pieces. While the copper designs are arguably the focus of this piece, the presence of the blankets should not be overlooked. Through the themes of connection, and settler and Indigenous relations, the blanket holds potent symbolism. As an object that brought disease and death to Indigenous communities at the hands of colonialism, the blanket is not just an object, but also a reminder of the past. However, these can also be viewed as sources for warmth and comfort. The multiplicity of this materiality shows the varied interpretations present in there is a reason for our connection, while also connecting past and present. The specific relationships between settlers and Indigenous people are prominent throughout the exhibition, but the concept of connection also finds a voice in the relationship between earth and sky, in fancy dance shawl for Sky Woman. Claus finds connection to her family and community through the teacups. there is a reason for our connection will be showing at the McCord Museum (690 Sherbrooke St. W.) until Aug. 11. Interactive introductions for the exhibition will be taking place on Wednesdays at 6 p.m. in French, and at 8 p.m. in English. Find more on the McCord’s website.